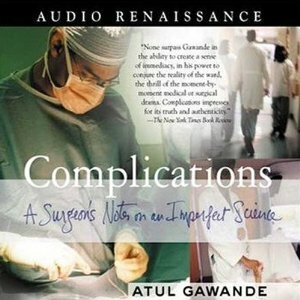 In Complications, Gawande, who was near the end of his surgical residency at the time of writing, draws from his own experiences and his research to explain how doctors make choices, why things sometimes go wrong, and why certain decisions are especially complex. There are chapters on training of new doctors, medical errors, specific medical conditions, the role of patient choice, and more. It’s fascinating reading, and more than a little unsettling. Not a lot that Gawande discusses came as a huge surprise to me, but suspecting something is true is different from having a knowledgeable person tell you it’s true. I bought this book for my stepmother for Christmas last year, thanks to recommendations from Raych and Eva (and with the thought the back of my mind that I could borrow it back and read it myself, ’cause that’s how I roll, y’all). Anyway, she loved it, and it has started making the rounds among all her nursing colleagues, so I figured I might as well listen to the audiobook instead of waiting for my turn. And I’m so glad I did. Gawande comes across as extremely compassionate and deeply concerned for patient care. This was especially evident in the chapter on obesity. Never once does Gawande take a condescending tone or treat obesity as a mere lack of will power. Gawande seems genuinely curious as to why some people have so much trouble curbing their appetite and why it’s difficult to impossible for so many to lose weight and keep it off. In a society that is too quick to dismiss fat people as lazy and gluttonous, Gawande’s concern and lack of judgmentalism are refreshing. I was also impressed with the chapters on medical mistakes and bad doctors. Here, Gawande’s worry about patient care is palpable, but he remains honest and open. Errors are part of being human, and doctors are human. But medical errors don’t just mean embarrassment or inconvenience; they sometimes mean death. It’s a serious matter, and you can tell that Gawande feels the tension between the imperative for good patient care and the recognition that even the best doctors are going to flub it sometimes. And some will flub it frequently, as in the chapter on bad doctors, which focuses not really on the monsters, but on the formerly good doctors who have lost their touch, perhaps because of an addiction, perhaps because of stress, perhaps because of burnout. Again, honesty and lack of condemnation are Gawande’s watchwords. The primary question is not, How can these doctors be punished? Instead, it’s How can we keep such doctors from hurting more people? As frightening as this book was in some respects, I’m grateful for Gawande’s candor. Living with a medical professional taught me long ago that doctors are not superheroes, but it’s refreshing to hear a doctor acknowledge it and even more refreshing to hear him explain how the profession is always looking for ways to improve. Highly recommended. This entry was posted in Audiobooks, Nonfiction. Bookmark the permalink. Good review! Does she give a reason why she wrote the book in the first place? Was it to tell patiences they have rights? Make us aware of possible problems or that no one ‘s perfect? He doesn’t really talk in detail about the reasons for writing. That’s an interesting question, though, and I’d be curious to know the answer. Great review! I got this book for Christmas from my mom because she knows I love this type of narrative nonfiction. I’m glad to hear it’s so good. I think you’d like this, Kim. It’s a nice blend of story-telling and research. Oh, no! Bendy spine! If it hadn’t grabbed you after a couple of chapters, it might not be the book for you (unless the spine was actually distracting you). The book doesn’t change in style much after the first few chapters. Ooh, if my brother decides to go into surgery, I’ll get him this book! I think it’s nice in that it doesn’t point fingers when things go wrong, but tries to explain them. This would be a great gift for a budding surgeon (or any doctor I imagine–my nursing stepmom and her colleagues loved it). This book has been on my radar for a little while now, and this is a wonderful review. I especially like your comments on Gawande’s non-judgmental approach. I tend to be turned off by authors who rampage on an agenda. I respect writers who seem to really examine an issue or situation from many angles and perspectives. If Gawande has an agenda, it’s to make sure people are informed, which means exploring multiple angles. Like you, I love that in a writer. I just read a New Yorker article by Gawande about the rise of Medical Homes in communities across the country (it was circulated at my place of work, since we’re a non-profit that does measurement & reporting on healthcare quality in Oregon), and I got from it the same sense of intellectual curiosity coupled with deep interest in patient experience and patient care you mention here. (In fact maybe that article was an offshoot of research for this book?) High-risk medical homes focus on the sickest, most high-utilization people in our society, and Gawande did a great job of being respectful of those people while still inquiring rigorously how they are handled in our current system. Emily, I believe Gawande has been a writer for New Yorker for many years. So probably this book grew out of the New Yorker articles he wrote in this past….and the article you wrote is for a future book…. Teresa, I liked this book too! And I also listened to it with growing impatience for how does it end. I also enjoyed BETTER. Another good look at doctors. And thanks, Rebecca, for the information about the New Yorker. I wasn’t aware of that. I’ll have to add Better to my list. He’s also written a book called The Checklist Manifesto that’s more of a business book (applying the checklist idea that surgeons use to other processes). I edited a column that discussed it recently, and it sounded like an interesting concept, but maybe not interesting enough for a whole book. There’s a short section in this book where he talks about how hospitals with surgeons who are still learning are often the ones that take care of the poor and uninsured. It’s not a major topic, though. And the chapters here do read like articles, so I imagine Rebecca is onto something when she says they might have been drawn from writing New Yorker he did for the New Yorker, and is apparently continuing to do. If you work in healthcare you’d probably find a lot here of interest (unless, like me, you try to avoid reading work-related topics in your off hours). I also listened to this book about 5 years ago and the flesh-eating bacteria chapter FREAKED me out! Immediately when I finished it, I cut my leg badly on the edge of my door frame, and couldn’t stop thinking “I’m going to get the flesh-eating disease!” Even though I rad the book years ago, I was telling my BF about the bad doctors chapter just a couple of weeks ago. It was really memorable. I’ve read Gawande’s subsequent books as soon as they’ve come out, and I hope his next one comes out soon! I know! That chapter was so scary, as was the chapter about the doctor who just kept adding pins to the guy’s hips until they shattered. Ick! Books about how medicine is practiced are so interesting to me. I think I’m going to add this one to my list! It’s a good one! Enjoy!